August was nice: we had several hot days and the rest of the month was on the cooler side. But perfume wear/test-wise it was a strange month for me: as I was trying to figure out if perfumes contributed to my persistent cough (I think they didn’t) I took a break from any perfumes for a while; in addition to that, at least several perfumes I wore during the month had such staying power that testing anything else the same day was out of question. As a result, I both tested and wore fewer perfumes. So I decided to entertain you with another type of statistics data. Do you remember the fun question Birgit of Olfactoria’s Travels asked last year: Guerlain or Chanel? and the results we compiled? So when last Monday Birgit asked to choose ten “deserted island perfumes”, I got curious to see if answers to this question correlated to the previous results. But when I started I couldn’t stop just there. 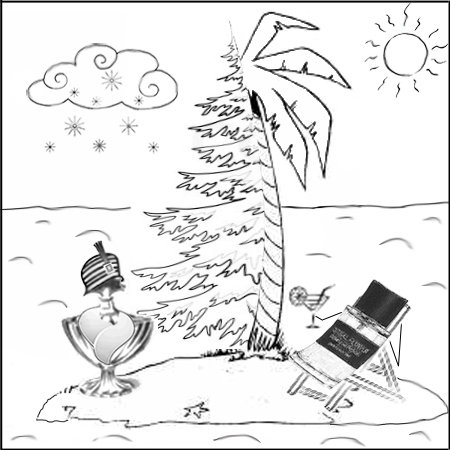 Our deserted island will be populated by at least 45 perfumistas, though there was some dissension as to the climate choice: concerns were voiced that not all favorite perfumes were tropic-friendly. Future settlers named 310 unique perfumes from 91 brands (when a concentration or vintage were mentioned I counted perfumes as unique). 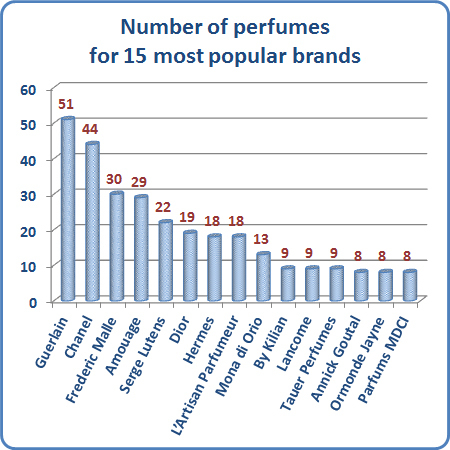 See the chart above for the total number of selected perfumes for top 15 brands. Two most popular perfumes were Guerlain Shalimar and Frederic Malle Carnal Flower – 11 voices each; Chanel No 5 got 6 votes (including one for parfum); Amouage Lyric, Chanel Coromandel, Lancome Cuir de Lancome, Serge Lutens Ambre Sultan and Chanel No 19 (counting EdP, EdT, parfum and vintage) got 5 voices each. 79 perfumes were named by more than one perfumista. It means that we’ll have 231 unrepeated perfumes to enjoy ourselves or swap – not bad for a group of 45. Only 4 out of 10 perfumes on my list were unique (Climat by Lancôme, Tiempe Passate by Antonia’s Flowers, Vert pour Madame by DSH Perfumes and Sweet Milk by Jo Malone). Only Chanel No 19 though was among the most popular selections. The other five were on two to three people’s lists. I wonder how good my swapping chances would be. Most of you are probably familiar with, I’m positive a well-studied and explained, phenomenon of the time going faster as you get older. I wasn’t curious enough to look for those explanations so at some point I came up with the one that seemed logical and left it at that. In our earlier years time is very discrete and structured: we always know which grade we are in, what semester (or quarter as it was in the country where I went to school) it is and when we’ll have the next break. Our years are distinctive in terms of classes, class-mates and teachers. And each year constitutes a significant part of our self-aware life. As we get older, finish our education and start working full-time, our lives become more unified, “continuous” and provide much less range poles for memory to measure against. Also a year becomes smaller and smaller relative to life lived. Small kids might improve that situation for their parents for a while but it’s still not the same and it goes away as they grow up. I didn’t know that at the time, but starting my blog a year ago served as an antidote to that acceleration tendency (probably just a temporary one but still). My life became much more structured. I’m constantly aware of not only a month (“Is it time for a monthly stats post?”) but also dates and days of the week (“I haven’t posted since the last Tuesday” or “I’m reading a six-days-old post – Is it still Ok to comment?”). This first year was veeery looong and really good for me. 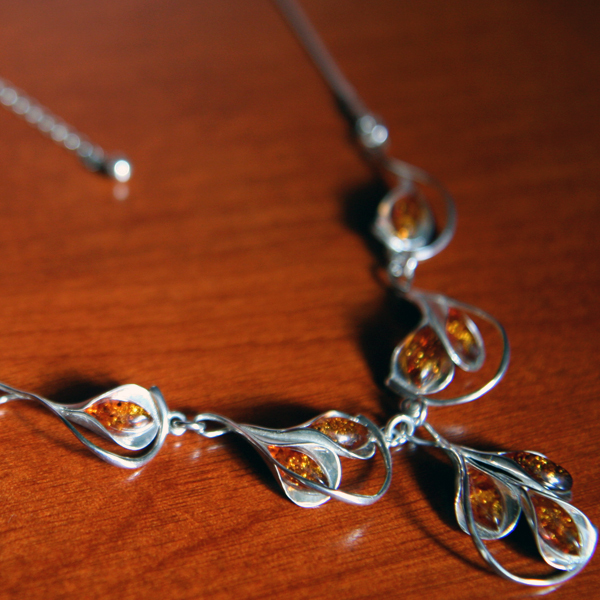 I published many more posts than I planned I would. I found many more blogo-friends than I hoped I would. And I discovered many more great perfumes than I thought I would. I’m thankful to all my friends, supporters and enablers influencers. Suzanne, lyu, Vanessa, Michael, Ines, Victoria, Ari, Diana, Joanne, Tara, Olga, Elisa, Thomas, Lavanya, Carol, Laurie, Meg, Krista, Asali and Christos – thank you. For reading, commenting, writing inspiring reviews and sharing perfumes. I appreciate every token of your support and value your friendship. Dee of beauty on the outside: after I won a drawing for a decant of Estee Lauder Bronze Goddess perfume on her blog, I liked it so much that I bought the last bottle at the store and then brought it with me on the trip to Hawaii – how often do you haul a FB to a vacation? (if you haven’t seen it yet, take a look at the Bronze Goddess’ picture from that trip, I think she looked great). Birgit of Olfactoria’s Travels: she described Annick Goutal Ambre Fetiche in such a way that I just had to try it! (well, Birgit does it a lot). I got a sample (thanks to Carrie), tried it and fell in love. So now finally I have a colored Annick Goutal’s bottle in my collection. Tarleisio of The Alembicated Genie: her beautiful writing resulted in not one but two new bottles in my collection: Serge Lutens Ambre Sultan and DSH Vert pour Madame. If you haven’t read The Incomparable Khadine and Vertesimilituda yet I dare you to do so and see if you can resist the urge to try these perfumes if you haven’t tried them yet or re-try if you have. Mals86 of The Muse in Wooden Shoes: here I told the story about my bottle of Puredistance Antonia and what role Mals played in it. 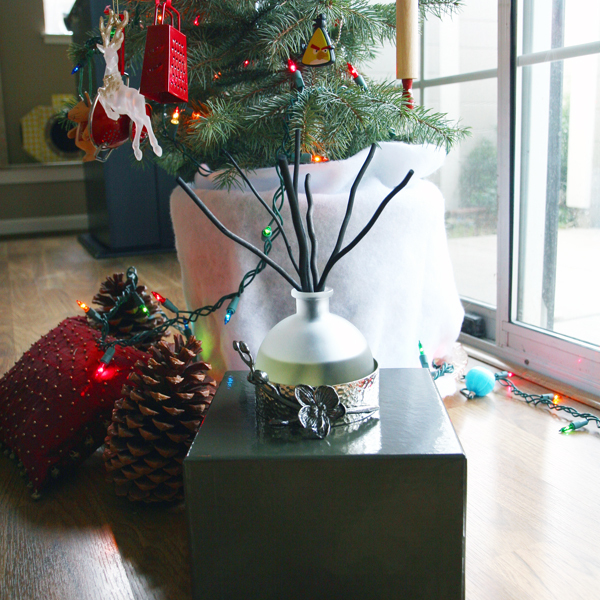 What else did this year of blogging give me? A complete realization of how great the climate where I live is.